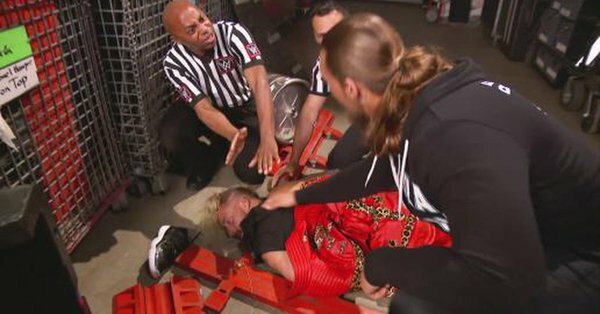 There was a lot of WWE TV this week (A lot of wrestling in general) and sometimes it is hard to keep up. Luckily, we did catch up and both RAW and SmackDown Live were perfectly cromulent shows this week. With both brands building momentum towards Extreme Rules and Money In The Bank respectively, what were the moments of the week? Alexa Bliss channeling her inner Sandmanperson? Sasha channeling her inner Stephanie McMahon? The Tag Team Match between Roman Reigns and Seth Rollins vs. Bray Wyatt and Samoa Joe? The moment of RAW goes to Finn Balor and Paul Heyman! The Advocate for the Beast Incarnate and WWE Universal Champion, Paul Heyman, made his return to RAW to inform Finn Balor that he actually…wants to see Finn Balor vs. Brock Lesnar, if Balor can win the Fatal Five Way at Extreme Rules. After Heyman’s endorsement, Finn went on to defeat his former Club friends, Karl Anderson and Luke Gallows. Then, Finn got taken down a peg by RAW GM, Kurt Angle, who mispronounced his name. Mispronunciation aside, it was a good night for Balor and a nice return for the Advocate. The promo is definitely worth checking out. Moving on to SmackDown Live, the Blue Brand’s next WWE Network Event, Money In The Bank is already shaping up to be huge. At Money In The Bank, AJ Styles vs. Kevin Owens vs. Dolph Ziggler vs. Baron Corbin vs. Sami Zayn vs. Shinsuke Nakamura will compete in a MITB Ladder Match, where the winner has the chance to cash in on a title opportunity against the WWE Champion any time they want. But was the moment of the show? Was it the WWE Championship Celebration of Jinder Mahal? Or Breezango quitting then returning to the Fashion Force? Or the night of roll-ups? It was none of these. It was actually AJ Styles and Shinsuke Nakamura teaming up to face Kevin Owens and Dolph Ziggler! The two teams wrestled for about a half an hour, with AJ Styles and Shinsuke Nakamura coming out on top. Despite Nakamura’s over the top antics, AJ Styles showed his formal NJPW rival some respect. We’re looking forward to what’s next on both RAW and SmackDown. This entry was posted in So That Happened, STH, WWE, WWE RAW, WWE Smackdown and tagged AJ Styles, Alexa Bliss, Alicia Fox, Baron Corbin, Bray Wyatt, Breezango, Broken Matt Hardy, Bullet Club, Dean Ambrose, Dolph Ziggler, Elias Sampson, Extreme Rules, Fandango, Finn Balor, Goldust, Jey Uso, Jimmy Uso, Jinder Mahal, Karl Anderson, Kevin Owens, Kurt Angle, Luke Gallows, Matt Hardy, Mickie James, Money in the Bank, Money In The Bank 2017, Noam Darr, Roman Reigns, Sami Zayn, Samoa Joe, Sasha Banks, Seth Rollins, Shinsuke Nakamura, SmackDown Live, So That Happened, STH, The Club, The Drifter, The Usos, Tyler Breeze, WWE, WWE Extreme Rules, WWE RAW, WWE Smackdown. Bookmark the permalink.